Thinking about the wonderful time I had two years ago at VinoVip Cortina. It was this past weekend but I am sticking closer to home this year. 2017 will be a great time to go back to that event but in the meantime, I am remembering the first time I tried this wine from Gianfranco Fino. A memorable event. 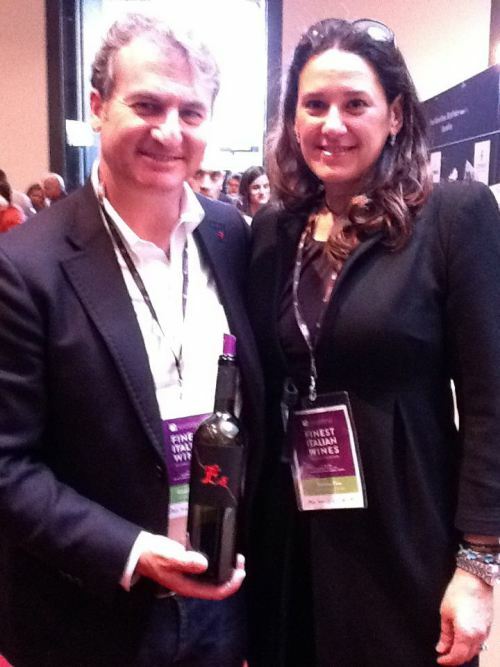 I had the pleasure of meeting Gianfranco Fino and Simona and tasting his wine L’Es for the first time last summer at VinoVip in Cortina. I was lucky enough to see them again this year at Operawine during Vinitaly. This was the first year that Fino’s wine was included in the Wine Spectator’s Top 100 Italian wines and he was quite elated when I saw him. Apparently, L’Es is quite the cult wine in Italy. I found both Gianfranco and Simona very engaging but was dubious if I would like the wine. Primitivo is a very powerful grape and often the wines produced with it knock my socks off, literally, so it isn’t a wine I order very often.